Thank you for subscribing to MPreviews.com. Established in 2001, MPreviews.com offers over 100,000 unique Massage Listings. 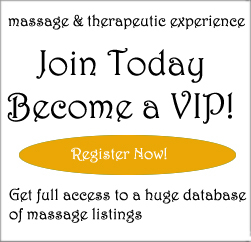 By becoming a VIP Member you will have unlimited access to the most reliable information posted by our users, of top rated massage businesses on the internet. Your opinions are useful, funny and cool because people like you take the time to share thoughtful insights on your massage and therapeutic experience. No reviews of any provider are added today.